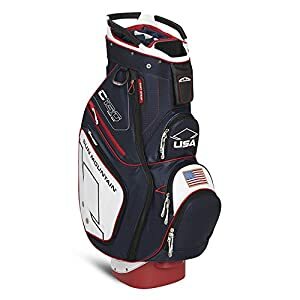 Sun Mountain C130 Golf Cart Bag – Navy/White/Red – 2015 Closeout Sun Mountain has a 30 year old history in the world of golf equipment and apparel. These guys put in a lot of thought into the design, function and construction of their products. This attitude of theirs has taken them a long way and made them the market leaders of manufacturing golfing equipment. The 14 full-length dividers ensure that your clubs stay organized and slide in and out easily. Also, the dividers are well padded so you don’t get any unnecessary wear on the shafts. The 14th section is to place the putter which can easily accommodate the biggest putter grips. Finally, the top is laid out in such a way that each club is easily accessible when it’s on the cart. The C130 gets the accessibility right in every aspect, you need to use it to experience what is being said here. Everything about the Sun Mountain C-130 Cart Bag is top class when it comes to quality and construction. The handles are always the apt way to assess the quality of a bag, and the C-130’s are excellent. Not all manufacturers get the handle right although it may seem an easy thing to do. From the handles on the top to the shoulder strap, they’re sturdy and durable. Similarly, the zippers have a quality feel and operate smoothly. Out of 18 ratings given by consumers of this product, the average ratings on Amazon.com for this product was 5 out of 5 stars which proves that this product is just top class! Most of the users were happy with their purchase and have left awesome reviews on the quality, build and storage. Most of them felt that they bought a product which gave them complete bang for their buck! I would not buy this golf bag. I purchased it 2 years ago and have been frustrated from day one as the bag wont stay upright, even when empty. For $229.00 It should do better than that. That’s sad to hear Helen. Would be curious to know which brand and model are you using now?